In November 2011, my friends Ward and Wendy Binns filed for adoption for a child from the Democratic Republic of Congo. As Wendy shared, "It's a beautiful country that is rich in natural resources but is a hard place to survive. There is war, disease and lack of infrastructure. Ultimately, there is a crisis with over 5 million orphans." On May 8 of 2012, they were matched with a young boy believed to be between 20-24 months old. Some farmers had found this boy alone in a rural area, without parents. 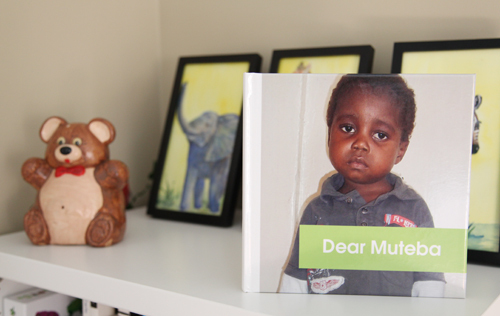 They took him to a nearby orphanage and he was given the name Muteba. The idea to adopt began shortly after Wendy was diagnosed with breast cancer, which was just one year after her own mother had been diagnosed. This adoption was the light at the end of the tunnel. As Wendy shared, "The breast cancer diagnosis shifted the way Ward and I felt about having children, what were we waiting for?" Wendy's breast cancer surgeon, Dr. Heather Richardson painted the murals in their new son's room, including this incredible giraffe to stand watch over Daniel Muteba (his new name) and to be his constant companion. In the spring of last year, Wendy was declared cancer free. (Her mom too!) Now Wendy and Ward could channel all their energy into welcoming Daniel. They wanted his room to be a place where he could feel safe and dream sweet dreams. As Wendy shared, "The room is happy and feels like a big, warm hug." Ward and Wendy made such an adorable book for Daniel, which they sent to the orphanage. 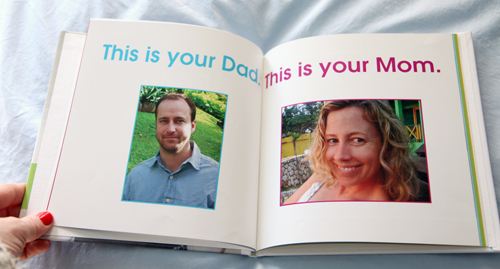 The book was a way to show Daniel pictures of his new mom and dad and his extended family. It most importantly told Daniel how much they loved him and think of him every day. Then there was the book Wendy and Ward worked on before his arrival, detailing each stage of his adoption process and their emotions leading up to the day they would meet- which they hoped would be before Christmas. They got their wish. On 12-12-12, Ward and Wendy met Daniel Muteba at the Cincinnati Airport. This is the first picture I saw of him on Facebook. He's got a smile to steal your heart. Wendy, "He walked right into Ward's arms. We just held him and loved on him. He seemed to know we belonged together."